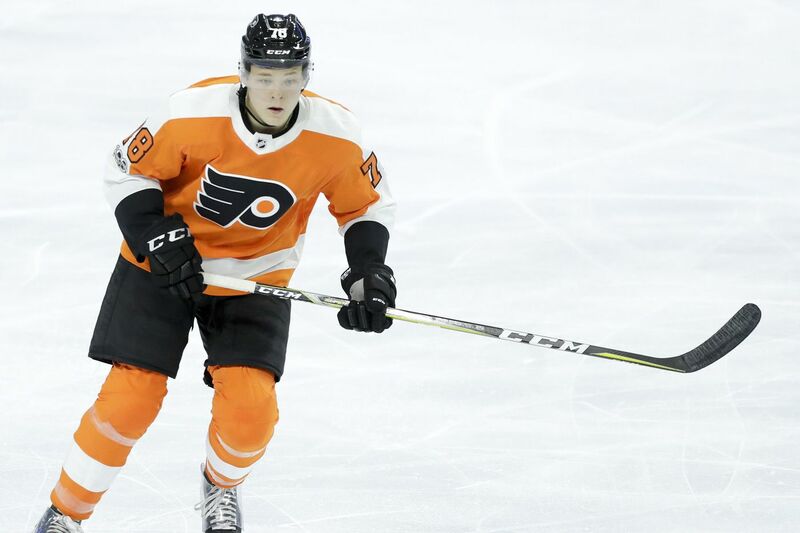 Flyers left wing prospect Matthew Strome has made strides in his skating ability since being drafted in 2017. Matthew Strome has the pedigree, the size, and the hockey smarts, and some thought he would be a first-round selection — like his two older brothers in earlier NHL drafts. But the 6-foot-3, 201-pound left winger wasn't selected by the Flyers until the fourth round in 2017 because of skating deficiencies, and he is out to prove that other teams made a mistake by allowing him to fall to the 106th overall pick. Thanks in part to work with a figure-skating coach, Strome made nice strides last season and finished with 37 goals and 68 points in 65 games with Hamilton in the Ontario Hockey League. "He had a real good year," general manager Ron Hextall said at the Flyers' development camp in Voorhees the other day. "Skating is always going to be something he has to work at, and the kid absolutely works his tail off. So he made some progress, for sure." Strome did extra skating throughout the OHL season. "Every day at practice I focused on it," he said. "At the end of practice, instead of just messing around with the puck, I went into the corner and worked on my stride, worked on having quick feet. I did that every day, and the repetition really helped me a lot." He noticed a difference from the previous season. "In certain situations, if there's a puck 10 feet away, I can get to it quicker," said Strome, 19, who plans to work with a figure-skating coach a few times a week this summer. Strome said he needs to get bigger and stronger to reach the NHL, but his skating "is the No. 1 thing I can work on." This was the second development camp that Strome attended with Flyers prospects. Camp ended Monday. "Last year, I was nervous. Now I know a lot of the guys better, and that made it [easier]," he said. "I just tried to learn from some of the older guys and relax out there. I felt a lot more comfortable." Strome was more accustomed to the fast play and, he said, the "really high-paced drills" in camp. "I'm going to go back to Hamilton and practice with that same pace, and I think it'll be really good for me," he said. Hextall said he doesn't expect Strome ever to be a great skater, "but if we can just ramp him up two levels, he's got a real good chance at playing in the National Hockey League." Strome's brothers, centers Ryan and Dylan, were high NHL draft selections. Ryan was drafted No. 5 overall by the Islanders in 2011, and had 13 goals for Edmonton last season. Dylan was taken No. 3 overall by Arizona in 2015, and he had four goals in 21 games for the Coyotes last season, when he also had 53 points in 50 games for the AHL's Tucson Roadrunners. "I turn to them for advice whenever I need it," Matthew Strome said.